Despite being one of the largest compact SUVs in the category, the 2012 Chevrolet Equinox offers excellent fuel economy and surprisingly precise steering. The Equinox utilizes its larger dimensions to provide its occupants with generous legroom and ample cargo space for their gear. I have had no problems with my Chevy Equinox. I have had no problems with my Chevy Equinox. The vehicle runs well! We have had this vehicle for over 4 years! I love how it drives. This vehicle has been reliable for my family. I never have to worry about the car not starting or other issues as far as how the vehicle runs. The vehicle handles well. The seats are comfortable. There is room in the backseat to fit two people with a car seat. It is spacious. We use it for camping and transporting a lot of items. I love that we can get our bulk shopping done and still have a comfortable ride home. I love the towing package! It is like I have a truck without having a truck! Passengers always tell me how smooth the ride is and there is enough room with the seats. We based our decision to get this vehicle due to the consumer report. The Equinox rated high in performance and low in vehicle issues. Equinox has a great design, and looks. The mileage is fantastic for a crossover SUV. The navigation feature is user friendly and great just to see where you are and get traffic updates. The interior design makes you think you are in a much more expensive vehicle and handles really good. I feel extremely safe and comfortable in it. The amenities are bountiful when it comes down to it with the OnStar, Bluetooth, blind-spot mirrors, rear view camera, etc. This is a great crossover vehicle. I would recommend this vehicle to anyone looking for an SUV. My fabulous white Equinox is called "the beauty" and does not look her age! I love my Equinox. It drives wonderfully and is very good on gas. The seats are comfortable and has plenty of room for passengers in the front seat and the back. The cargo area is huge! When we first bought the car, it was used. The windshield wipers did not work, so my husband took them apart. A grommet in the wipers had worn out so he just replaced them with a bolt, nut and washers. They have worked wonderfully since. The no hands phone is my favorite and the fact that it, the radio controls are in the steering wheel make it a plus. The side mirrors have a defrost on them that make it a little easier on cold mornings. It has a rear back-up camera that makes backing into a parking spot or out of one wonderful especially since I am short and have a hard time looking over everything. I am totally loving this vehicle! 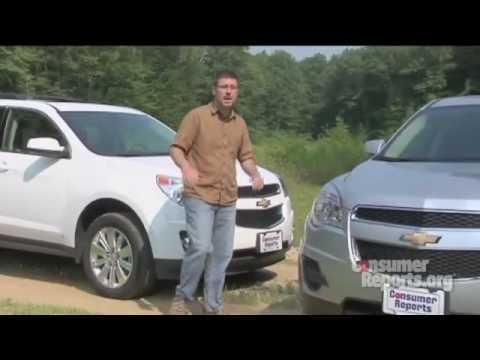 Why you should own a Chevrolet Equinox. I have had no mechanical issues with the Chevrolet Equinox. I like it because the seat rises and moves forward. The back of the seat also comes forward to help support and rest my back. This enables me to see better while driving and especially parking and backing up. My husband is on a walker. He does not drive but it is easier for him enter and exit the automobile. It seats five easily and has room in the back for groceries and/or other items which I may need to haul. It drives smoothly, turns easily and does not take an enormous amount of space to turn or park. I have never had a problem with it starting, slowing down or stopping smoothly. Since the seat rises and lowers easily it better suited for me since I am only five feet tall. The Insurance Institute for Highway Safety is a non-profit group which conducts safety testing beyond federal regulations. "Good" is the highest rating. JD Power's Initial Quality Study measures issues with a vehicle the first 90 days after purchase. Body & Interior Design ? GENERAL MOTORS (GM) IS RECALLING CERTAIN MODEL YEAR 2012 CHEVROLET EQUINOX AND GMC TERRAIN VEHICLES, MANUFACTURED FROM JULY 18, 2011, THROUGH SEPTEMBER 6, 2011, FOR FAILING TO COMPLY WITH THE REQUIREMENTS OF FEDERAL MOTOR VEHICLE SAFETY STANDARD NUMBER 138, "TIRE PRESSURE MONITORING SYSTEM" (TPMS). THE TIRE PRESSURE MONITORING SYSTEM IS DESIGNED TO ILLUMINATE THE TIRE PRESSURE WARNING LIGHT WHEN THE PRESSURE IN A TIRE IS 25% BELOW THE RECOMMENDED COLD TIRE PRESSURE. ON THESE VEHICLES, THE LIGHT WILL NOT ILLUMINATE UNTIL THE TIRE PRESSURE IS MORE THAN 25% BELOW THE RECOMMENDED COLD TIRE PRESSURE. UNDERINFLATED TIRES CAN RESULT IN TIRE OVERLOADING AND OVERHEATING, WHICH COULD LEAD TO A BLOWOUT AND POSSIBLE CRASH. THE RESULTING CRASH COULD CAUSE SERIOUS INJURY. UNDERINFLATED TIRES CAN ALSO RESULT IN PREMATURE OR IRREGULAR WEAR, POOR HANDLING, AND POOR FUEL ECONOMY. GM DEALERS WILL UPDATE THE BODY CONTROL MODULE FREE OF CHARGE. THE SAFETY RECALL IS EXPECTED TO BEGIN DURING OCTOBER 2011. OWNERS MAY CONTACT CHEVROLET AT 1-800-630-2438 AND GMC AT 1-866-996-9463. General Motors LLC (GM) is recalling certain model year 2016-2017 Buick Verano and 2016 Chevrolet Malibu as the electronic park lock lever may allow the ignition key to be removed without the transmission being in PARK. Also, certain 2013 Buick Encore, 2011 Buick Regal, 2013-2014 Buick Verano, 2011-2016 Chevrolet Cruze, 2010-2013 Chevrolet Equinox 2013-2015 Chevrolet Malibu, and 2011-2013 GMC Terrain vehicles may have been serviced with similar defective replacement electronic park lock levers. As such, these vehicles fail to comply with the requirements of Federal Motor Vehicle Safety Standard (FMVSS) number 114, "Theft Protection and Rollaway Prevention." If the key is removed without the transmission in PARK, the vehicle may rollaway as occupants are exiting, increasing the risk of injury. GM will notify owners, and dealers will inspect and if necessary replace the key cylinder lock housing, free of charge. The manufacturer has not yet provided a notification schedule. Owners may contact Chevrolet customer service at 1-800-222-1020, Buiick 1-800-521-7300, and GMC 1-800-462-8782. GM's number for this recall is 50490 and 50491. General Motors LLC (GM) is recalling certain model year 2011-2012 Buick LaCrosse, Regal and Chevrolet Camaro, as well as certain 2010-2012 Cadillac SRX, Chevrolet Equinox and GMC Terrain vehicles, equipped with power height adjustable driver and passenger seats. In the affected vehicles, the bolt that secures the driver's and passenger's power front seat height adjuster may fall out causing the seat to drop suddenly to the lowest vertical position. If the driver's seat unexpectedly drops, the distraction and altered seat position may affect the drivers' control of the vehicle, increasing the risk of a crash. GM will notify owners, and dealers will replace the height adjuster shoulder bolts, free of charge. The manufacturer has not yet provided a notification schedule. Owners may contact GM customer service at 1-800-521-7300 (Buick), 1-800-458-8006 (Cadillac), 1-800-222-1020 (Chevrolet), or 1-800-462-8782 (GMC). GM's number for this recall is 14271. Taken from the Initial Quality Study (IQS), which looks at owner-reported problems in the first 90 days of new-vehicle ownership, this score is based on problems with the engine or transmission as well as problems that affect the driving experience (i.e., vehicle/brakes pull, abnormal noises or vibrations). Taken from the Initial Quality Study (IQS), which looks at owner-reported problems in the first 90 days of new-vehicle ownership, this score is based on problems that have caused a complete breakdown or malfunction of any component, feature, or item (i.e., components that stop working or trim pieces that break or come loose). Taken from the Initial Quality Study (IQS), which looks at owner-reported problems in the first 90 days of new-vehicle ownership, this score is based on problems with the engine or transmission as well as problems that affect the driving experience (i.e., excessive brake dust, brake noise, excessive oil consumption and battery failed). Taken from the Initial Quality Study (IQS), which looks at owner-reported problems in the first 90 days of new-vehicle ownership, this score is based on problems with exterior, seats and interior (i.e., memory seat controls difficult to use, center console difficult to use and materials scuffs/soils easily). Taken from the Initial Quality Study (IQS), which looks at owner-reported problems in the first 90 days of new-vehicle ownership, this score is based on problems with the windshield wipers, navigation system, rear-seat entertainment system, heater, air conditioner, stereo system, sunroof and trip computer.